Black and Beauty comes in 20 Familystyles. 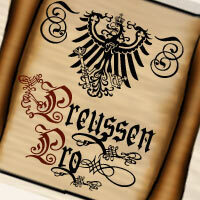 Preussen Pro comes in 4 Familystyles . Pressen comes with some typical Preussen-Illustrations. Drago comes in 5 Familystyles . This Font comes with many Dragon-illustrations.